This scholarship recognizes innovative teens who manage their own business or social venture. 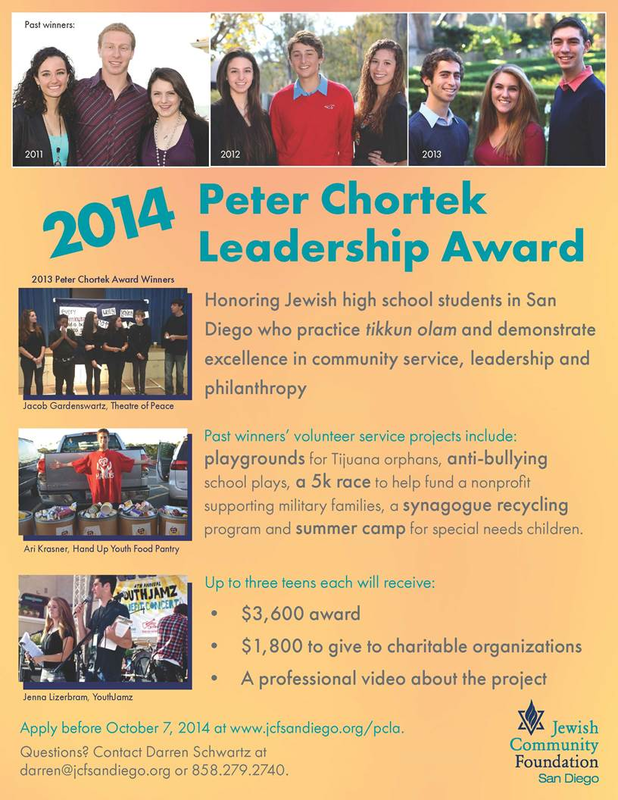 This scholarship is available to graduating high school seniors of all faiths, in San Diego County, who plan to attend two- or four-year colleges or universities. More information. The deadline for application is March 2, 2015. The MZ Teens program is a high school leadership program that prepares students for the challenges they may face regarding Israel in college and in their communities. Upon completion of the program, participants will be prepared to comfortably take the reigns of leadership the moment they start college and they will be automatically part of the StandWithUs MZ Alumni Program. The Alumni program will keep the students on track to continue their Israel advocacy efforts, provide them with new and exciting opportunities for advanced Israel advocacy, and funnel them into our college-level Israel advocacy program upon their entrance into college. Students will continue to receive support from StandWithUs throughout their college career and beyond. For more information, contact Miri Kornfeld, director of the MZ Teens Internship.